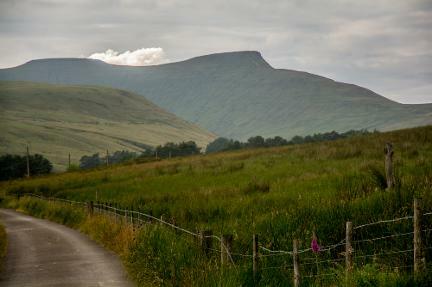 It may surprise many visitors to the Brecon Beacons National Park that it is not an untamed wilderness. People have lived in it for thousands of years and this is very evident in the landscape. This fascinating tour explores how the area we now call the Brecon Beacons National Park was central to the Industrial Revolution with tramroads and canals criss-crossing the landscape, and how part of the National Park is also within the Blaenavon World Heritage Site. 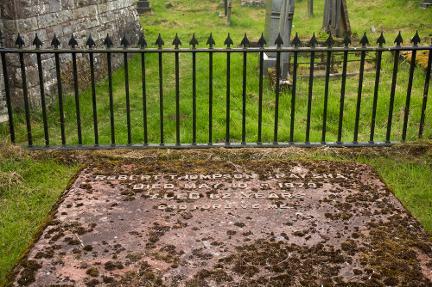 The grave of Robert Thompson Crawshay in the graveyard at Vaynor Church with the inscription "God Forgive Me"
E.P. Martin, my great-great- grandfather and former General Manager of the Blaenavon and later the Dowlais Ironworks. Llanwenarth Viewpoint - Our first stop. This is the normal starting point for hikes up the Sugar Loaf mountain. We stop here for commanding views over Abergavenny, the Usk Valley and the Clydach Gorge, which is visited later in the tour. Crickhowell - We pass through this beautiful market town that sits under Table Mountain, home of the Iron Age fort Crug Hywel that gives the town its name. As we pass through, we view its Norman Castle and pass over its 18th century bridge which is the longest stone bridge in Wales. Llangattock - Here we have our first view of the Monmouthshire and Becon canal, or simply the 'Mon and Brec'. This canal which looks so idyllic and rural now was built to feed industry. Coal, iron and limestone was quarried and mined from the mountains above and brought by tramway to the canal, where it was barged down to the coast at Newport. Craig y Cilau Nature Reserve - This beautiful site sums up Beauty and the Beast. 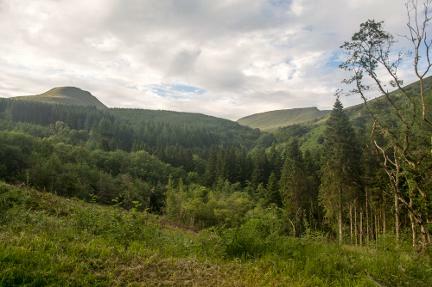 It is one of Wales' most outstanding botanical sites, famous for its exceptional variety of alpine plants and trees, but it is no untouched wilderness. It is in fact a former limestone quarry. The limestone was hauled by horse drawn tramway either to the ironworks at Brynmawr or to the Mon and Brec canal at Llangattock. Myndyth Llangynidr - We drive on up the Llangynidr mountain to another limestone quarry and a fantastic viewpoint over the southern Black Mountains and Llangorse Lake, the largest natural lake in Wales. This mountain is also the site of the Chartist's cave. We descend the mountain to the village of Llangynidr which has 4 working canal locks. We continue following the canal, seeing it disappear into and then reappear from the Ashford Tunnel, before we arrive at the village of Talybont. 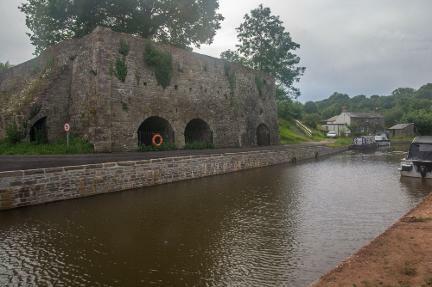 Talybont - Here we stop at Overton Wharf and see impressive limekilns and the terminus of the now disappeared Brinore tramroad that used to bring limestone from Trefil quarry and coal from Tredegar to the canal. We also see 2 disused bridges where the now-dismantled Brecon and Methry railways used to pass over the road and the canal. 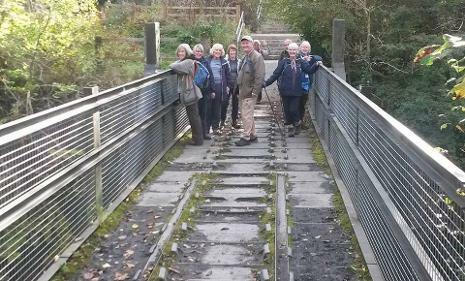 We then cross over the canal again ourselves, this time on a lift bridge, turn and start ascending the beautiful Talybont Valley that contains the Talybont Reservoir and the dismantled railway line. 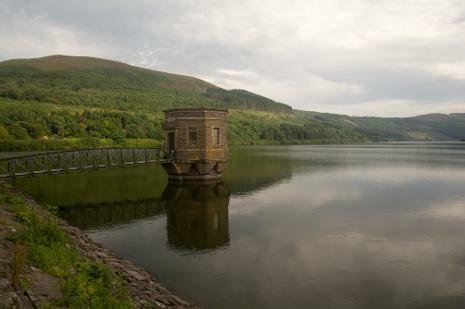 Talybont Reservoir is man-made like all reservoirs but it looks incredibly peaceful and 'natural'; at the northern end of the reservoir, where the river Caerfanell flows into it, is an important feeding ground for geese and herons. 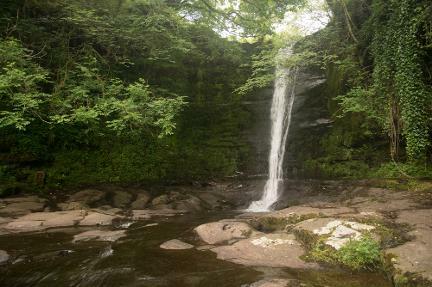 Blaen-y-Glyn waterfalls - Here we park up and take a half an hour walk along the banks of the river Caerfanell to a series of charming waterfalls. After this we continue up a very steep road right in the very heart of the Brecon Beacons National Park. We pass the now-reopened Torpantau station, which is the terminus for the Brecon Mountain Railway and reach a place near the Neudd reservoir for a close up view of the main Brecon Beacons peaks. After this we continue down the Taff Fechan Valley past Pentwyn and Pontsticill Reservoirs, through the village of Pontsticill, to arrive at the village of Vaynor. Vaynor - This village was historically part of Brecknockshire but was transferred to be part of Merthyr Tydfil in 1974. The church in Vaynor was built in 874 or 714 but was burnt down in the battle of Maesvaynor in 1291. The replacement church became dilapidated by 1867 and was replaced by the Crawshay family in 1870. In the church yard we see the grave of the 'Iron King' Robert Thompson Crawshay. The ten ton stone slab is famously engraved with the words 'God Forgive me', possibly inscribed because he felt guilty for closing the Cyfarthfa Works, thus making hundreds of families destitute. Methyr Tydfil - We then leave the National Park and descend into Merthyr Tydfil which was once Wales' biggest town. It was home to 4 separate ironworks, 2 of which, Cyfarthfa and Dowlais, both took turns at being the largest ironworks in the world. Merthyr is also the place where the world's first ever steam train journey took place in 1804, and is home to the world's oldest surviving iron railway bridge. As we enter Merthyr we pass the impressive Cefn Coed viaduct, which is the third largest in Wales. It was built to bring the Brecon and Merthyr railway into Merthyr whilst avoiding Crawshay land. We then stop at the ruined blast furnaces of Cyfarthfa ironworks. It is an eerie run-down place, and it is sad to think that this forgotten site, now thoroughly uncelebrated, was once the biggest ironworks in the world. Pont-y-Cafnau - Sometimes called the Bridge of Troughs, Pont-y-Cafnau is the oldest surviving iron railway bridge in the world and also part of the Cyfarthfa ironworks site. Cyfarthfa Castle - We make a quick stop here. It was the home of the Crawshays and the place where they could look down on their ironworks below. Trevithick Monument - We pause at this monument that remembers the world's first ever steam train journey. Dowlais ironworks - Sadly there is very little left to see at the Dowlais works except a large engine house and the last ingot to be produced at the Works. When Dowlais was built it overtook Carfarthfa to become the world's largest ironworks, My own great-great-grandfather was, for a time, general manager of the works. We then leave Merthyr Tydfil and for 10 minutes speed along the recently dualled Heads of the Valleys road, that more or less forms the southern boundary of the national park. As we pass along this road we see Tredgar which is the other terminus of the Brinore tramroad. We pass the road's highest point (417m) and then reenter the National Park at the Clydach Gorge. Clydach Gorge and Iron Works - The Clydach Gorge was one of the first areas in the region to be industrialised but still retains spectacular natural beauty, really summing up the idea of 'Beauty and the Beast'. The original charcoal fuelled furnace at Llanelly, now disappeared, was built in the sixteenth century and the Clydach ironworks were built in 1793. The iron works have their own special bridge, Smart's Bridge, a cast iron bridge built in 1824 to allow a tramway to pass over it. After visiting the ironworks, we head up the gorge, passing limestone workings and kilns and enter the Blaenavon World Heritage Site. 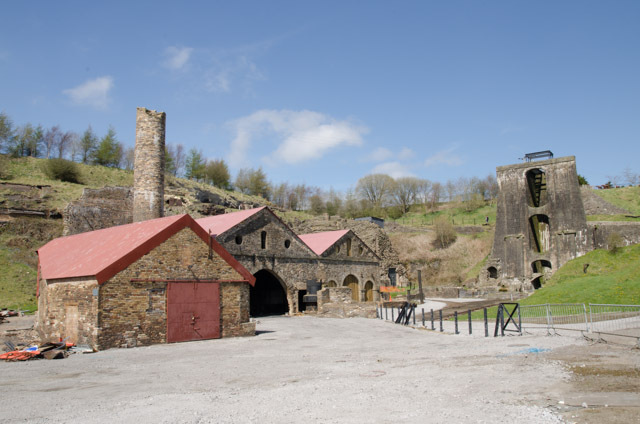 Blaenavon Ironworks - These works, the showpiece of the World Heritage Site, began life in 1787 and were crucially important in the discovery of how to make steel from cheap, high sulphur containing iron ore. This discovery was made by Sidney Gilchrist Thomas and his cousin Percy Gilchrist using a Bessemer converter. The discoverers were assisted by my own great-great-grandfather Edward Pritchard Martin who was manager of the Blaenavon Ironworks at that time. This discovery led on to the Industrial Revolution to spread out around the world. Big Pit National Coal Museum - This mine is also part of the Bleanavon World Heritage Site and was a working coal mine from 1880 to 1980. This is an excellent place to visit and we can join an optional underground tour with former miners, or simply explore the site which is packed with information about what it was like to be a Welsh miner. After our visit here, it will be time to return you to Abergavenny station or your Brecon Beacons accommodation.